Vegan Mushroom Walnut Bourguignon.. What could be better on a cold winter night? Vegan mushroom bourguignon is hearty, satisfying, and soooo flavorful. I’ve been obsessed with this dish since the first time I tried it. Despite not being able to actually pronounce the name, I set out to create my own version. I added mushrooms for extra crunch and meatiness and more red wine than it typically calls for, because YUM. 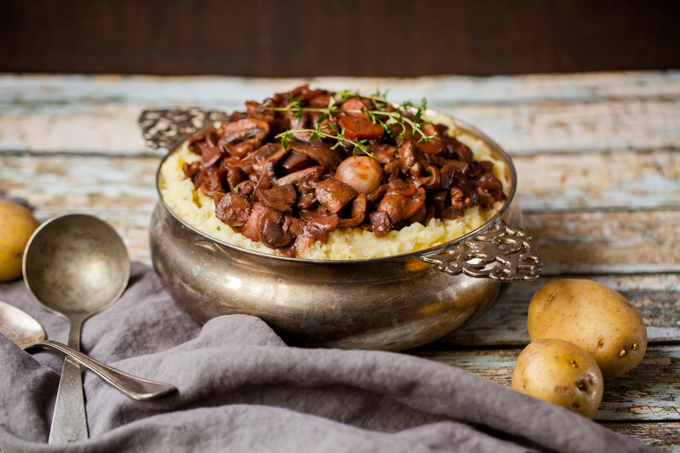 I paired the vegan mushroom walnut bourguignon with a bowl of fluffy cauliflower mashed potatoes to keep it light, yet satisfying. The best part? The whole meal comes together in just 30 minutes making it the perfect dish to serve for dinner parties. You’ll have plenty of time to spend with guests and won’t have to slave away in the kitchen all day! Plus the mushrooms and walnuts are so meaty and satisfying, this dish definitely doesn’t sacrifice flavor. I’m a huge fan of using mushrooms as a “meat” replacement. I also use mushrooms in our Vegan Zucchini Lasagna, Vegan Baja Fish Tacos, and Vegan Portobello Lentil Shepherd’s Pie! Know someone who will enjoy this recipe? Share it with them! To save it for later, pin the photo below. Cheers, friends! Hope you’re all having such a wonderful Holiday season so far. A rich, hearty mushroom stew flavored with walnuts, red wine, and fresh thyme leaves. Served over light, fluffy cauliflower mashed potatoes for a warm, comforting dinner that's ready in just over 30 minutes. Heat 1 Tbsp oil in a large sauce pan over medium high heat. Sear the mushrooms and pearl onions for 3-4 minutes until they become darker. Before the mushrooms release water, remove them from the pan and set aside. Reduce heat to medium and add another Tbsp olive oil to the pan. Throw in the onion, carrots, thyme, salt + pepper and cook for another 5 minutes. Stir in the garlic and walnuts and continue cooking for 4-5 minutes more. Pour 1 cup of the wine into the pan and turn the heat back up to medium high. Reduce the wine by half, stirring often. Be sure to frequently scrape the bottom of the pan. Add the tomato paste and vegetable broth. Stir until evenly mixed then add the pearl onions and seared mushrooms. Pour in the remaining ½ cup of wine and reduce heat to medium low. Simmer for 12-15 minutes until the onions begin to soften. Meanwhile, bring a small pot of water to boil and throw in the cauliflower and potatoes. Boil for 8-10 minutes until fork tender. Drain then add to a food processor bowl with the vegan butter, almond milk, salt + pepper. Process for 2-3 minutes until smooth and fluffy. In a small bowl, whisk together 2 Tbsp melted vegan butter and the chickpea flour. Stir the mixture into the mushroom bourguignon pan to thicken the gravy. Add more thyme, salt, or pepper to taste and continue simmering for another 5 minutes. If the gravy is too thick, add more wine. If it’s thin, boil down until it reaches your desired consistency. *Recipe time reflects using pre-sliced mushrooms, pre-chopped walnuts, pre-cut cauliflower florets, and making the cauliflower mash while the bourguignon is cooking. Using whole vegetables will add another 20-25 minutes to your prep time. Amazing ! I have to try this ! Thanks for sharing and your pics are beautiful. I made this for new year’s eve and it was delicious! But it took more like an hour and a half to make. Slicing 2 lbs of mushrooms and chopping onions, carrots, walnuts and garlic took a lot longer than 5 minutes! Thanks for the feedback Helga! I use pre-sliced mushrooms and chopped walnuts to save time. I’ll reflect this in the notes. Glad you liked it and Happy New Year! I was wondering if I could substitute vegan butter with coconut oil? Vegan butter is not really available where I live. I would suggest using olive or grapeseed oil instead of coconut if you have it available. The coconut flavor would likely not work well with this dish. I have yet to try anything that doesn’t go well with coconut oil. I made this tonight and my husband and I liked it a lot. I agree with the comment above, though–with prep time it took me more like 1.5-2 hours to make this dish. But it was very tasty in the end! Thanks so much for your feedback Ellen! I will update the recipe info to reflect that it can take a longer time. It takes me 30 minutes to make, but I purchase pre-sliced mushrooms, tend to work fast, and make several items at once. Looks yummy. If you eat legumes, try substituting an equal volume of cooked white kidney beans for the potato in the cauliflower mash. It will bump up the protein a little and gives great texture. Loved this warm dish. It took me 35 mins start to finish. Just chopped and cooked and chopped somemore while cooking. Thank you! Will add to my recipes. the cauliflower is not precooked, is that right? Can the wine be replaced with something else? Loved this recipe… the hearty flavour was delicious! I served with a baked potato and some garden peas. Easy to cook and will definitely be making it again… Thank you! I did it today! Amazing! Thanks! Love all the recipes and videos. Do you think it would freeze okay? it freezes fine although the nuts and mushrooms will loose their fresh texture and a bit of the taste. This recipe was absolutely fabulous! Sooo much flavor and depth! I added a little cayenne to the potato mash to give it a little kick, but wow what a delicious recipe. Is vegan butter simply margarine? My wife and I just made and ate this…oh my !..definitely a keeper. Took us about 30 mins…working tag team !..We loved it ! I love the idea of this recipe but I have mushroom haters. I know I could use truffle oil, but what could replace the mushrooms for texture? Waw…Looking so yummy and healthy. HOLY SMOKES THIS WAS GOOD!! Like many of the other commenters, this took me longer than 30 minutes, more like 1 hour…but it was so worth it! I loved the addition of the walnuts as it brought a more heartiness to this meal. The only addition I added was a few lentils for some added fiber and protein. This recipe will definitely be included in my weekly rotation, especially as the weather gets colder! Yummy!!!!! It was more labour intensive that I thought but worth it. I would hand mash the potatoes/ cauliflower mixture as it got a bit soupy when topped with the bourginoin. I will be making ‘‘tis for our meat-eating company and will be surprised if they don’t love it. Hello! I made that receipe a few times, will make it again today cause: it soooo good!!! For the second time I had guess over, they are not vegetarians but they really enjoyed their meal. Thank you so much for the feedback Suzanne! I’m so happy your guests enjoyed the meal! Can this be made the night before minus the cauliflower? Do you think it will hold up? Have a lot of dishes being prepared the day of.